You've got home, unboxed and then set up your Samsung Galaxy Note 8 and now you're trying to play around with every new feature as quickly as possible. You may not know every shortcut and trick out there for the new phone though. 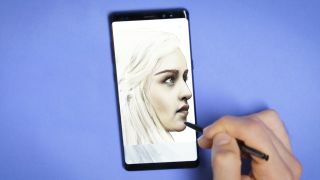 With the S Pen stylus and some of the most up to date software on the planet, the Galaxy Note 8 is a feature-packed phone, but some of the highlights can be hidden under the surface. Here we’re going to talk you through some of the key tips and tricks you need to learn to make the most of your new Samsung phablet. As you’re using a recent Samsung phone, much like the Samsung Galaxy S8 and Samsung Galaxy S8 Plus, you can use Bixby. That’s Samsung's own voice assistant technology that works in a similar way to Siri on Apple products and Google Assistant on most Android devices. It's worth giving Bixby a try as it can control your music, provide you with your daily routine and do a number of other things. There’s even something called Bixby Vision, which allows you to take photos of what you can see and have Bixby identify it if it's a landmark, translate it if it's text or track it down if it's a product. This is especially useful when you’re on holiday and you’re looking at a tourist attraction but need that extra piece of information, but be warned it may not always work. As great as Bixby is, there’s a button on the side of the phone that opens the portal and that can get quite irritating when you accidentally press it. Samsung has started to understand that not everyone wants to use this feature, so it now allows you to turn the Bixby button off. You can’t remap said button, but you can just turn it off altogether and we’ve written a whole guide here to help you learn how to turn off the Bixby button. Being able to take notes is one of the biggest benefits of the Galaxy Note 8 and its S Pen stylus, but we often find ourselves noting down things in a hurry without much time to unlock our phone and boot up a specific note-taking app. Luckily Samsung has prepared for this problem with the Galaxy Note 8, as the phone supports screen off note-taking, allowing you to scribble down on your display without turning it on properly. It’s smart and works well, so you can just pop out your S Pen while the screen is off and start scribbling without having to search through your apps. Want to make the most of your screen on the Galaxy Note 8? You may not know, but Samsung has limited it to Full HD resolution by default despite it packing a QHD+ panel. If you want to use your display at full power, you can head into the settings, press display and you can change it to QHD under screen resolution. That’s a smart decision if you’re going to be using this a lot for virtual reality. Be warned this will likely push your battery a little bit harder, so you’ll find it dies off a little earlier in the day than if you left it on Full HD. You likely know the Galaxy Note 8 is a waterproof phone, but did you know you can still use the S Pen stylus when it’s covered in water? That means you can take notes and scroll around the phone even when it’s dripping wet. We don’t normally find much use for this, but it does mean you can still use the S Pen when it’s raining and you won’t have to worry about getting your stylus a little soggy. Samsung Dex is a dock you can use to connect your phone up to a monitor with a keyboard and mouse and use it as a productivity device. It works well, as you can have the docking station permanently on your desk along with a monitor, keyboard and mouse, then just slide your phone in when you need to. It won’t be a useful tool for everybody, but it's an easy way to make your Note 8's screen even bigger. If you spot text in a foreign language, you can use the S Pen to highlight it and your phone will then display its best translation in your chosen language. It's a smart feature, but as with any translating tech it can sometimes misread some of the sentences. The Note 8's 6.3-inch screen makes it one of the best phones for multi-tasking, especially as you can use Android's split screen view here. It's a simple process too. You'll need to hit the 'Recents' button on the soft keys at the bottom of the screen, which you may know as the currently running app menu. Now you can tap the multitasking tab on your already open apps (it’s the one that looks like two rectangles atop each other) and it will open them in a compressed half screen view. Then you can drag the line between them to resize the apps. Don't like the order of the toggles in the notification shade when you bring it down from the top of the screen? You can choose your own order so you can put your most-used features into the first screen of the shade. To do this, pull your finger down from the top of the screen to open up the notification shade. Then you'll want to press on the cog in the top right and press 'button order'. This will then allow you to switch up the order. Head into the Sound and Vibration menu within Settings and you'll find an option called 'Adapt Sound', where you can take a hearing test designed by Samsung to personalize the audio you hear on the phone. It will give you a series of beeps for the initial part of the test and then will ask what ear you prefer to hear your phone calls in. After that, you should find audio far better when you've got the 'Adapt Sound' feature turned on.